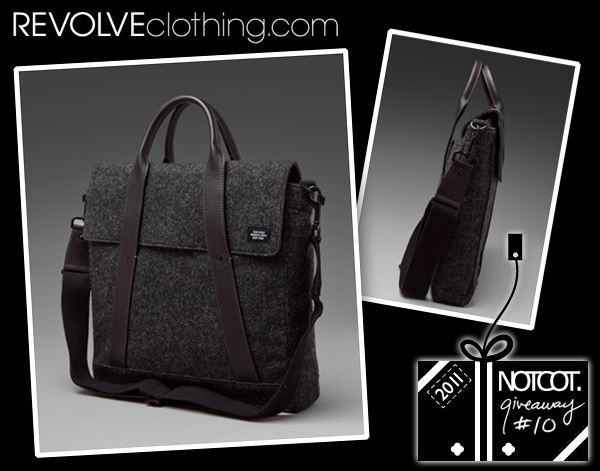 For a chance to win the Jack Spade Waxed Wool Flag Tote from Revolve Clothing, leave a comment with your go to holiday party essential before midnight PST on Dec 9th, 2011 and we’ll notify the winner by email! 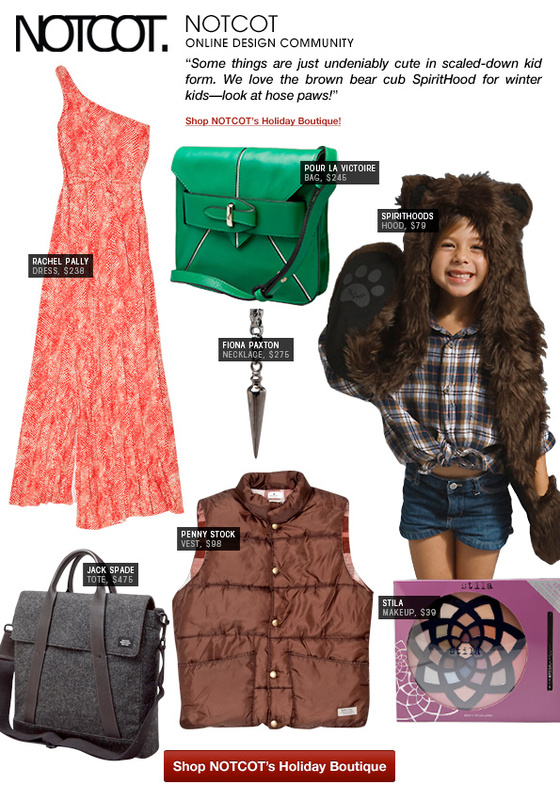 And check out a peek at our NOTCOT curated Holiday Boutique over at Revolve! With my family? A flask full of Laird’s Applejack. Holiday Essential - Meditation. Times are bound to get stressful… even fun times take planning! You need to unwind in order to be able to appreciate all of the holiday fun! Flat shoes! Nothing worse than falling on your face upon your entrance or falling backwards on your exit! My go to party essential is my accessories incl. my iPhone! My holiday party essentials: faith, hope, and love. The rest is just details. Drawings because I’ll probably still have work to finish after I get home. My go to party essential is an usual accessory - not flashy, but interesting enough to be a conversation starter. Great style is all in the details. My holiday go-to essential is Red Stag, black cherry bourbon whiskey. Add some vanilla vodka, grenadine, and coke(or diet) and magic happens. Party Essentials: Playlist, booze and camera. My go to holiday party essential is my group of friends. Would just not be the same without them. Holiday party essential = good pair of mitts/gloves, so you don’t have freezing hands when you arrive and need to hug/shake hands! !!!!!!! !The ESSENTIAL is to have my clothes ons (Except the very exceptional parties =D)!!!! My holiday party essential is my dancing feet mixed with bloody mary’s. Yolatengo!! Homemade Guinness gingerbread & a killer dress. If I could only have one holiday party essential it would have to be my family! During the holidays I like to make sure everyone gets together and has a great time, and with all the chaos circling around in our lives it’s good to relax and have fun with people I love and feel comfortable with. Happy Holidays! A fully grown winter beard. My party essential would have to be: A good playlist. Nothing keeps the holiday spirits brighter than a good song that everyone can sing or hum to. That, and some great drinks! Party Essential: Is a good playlist. Music sets the tone for the entire party. A flask filled with something good - in case the good stuff runs out (or never existed), and to share with the host in a dark corner. my holiday party essential is friends, food, and my bag to put in my computer, phone, and wallet!! that bag is awesome! My go to holiday party essential is usually an ornament I’ve made for all the partygoers. Each year I come up with a new design. My party essential is something glittery! holiday music, can’t party without it! A special She with a twist of snow. I usually *have* to bring something to eat. Running out for food is lame and time consuming. Cooking party = better party. My brown suede wingtips- they go with my casual and formal holiday party attire! holiday party essential would be my dancin’ shoes! i’ll be jinglin’ & janglin’ all night long. My party essentials are my friends. Other than that, probably a computer and a separate room to use it in. my holiday party essential has to be MUSIC played! O.O the bag loooks aweesommeee!!! i want! hahaha… gotta look my best before heading to party with the foreign beauties. A bottle of a Islay single malt. It depends on the party, but alcohol is generally involved. I know it sounds silly, but I can’t go to a party without nail polish. I’ll break out with my OPI ‘You Don’t Know Jacques’. I can go without lipstick and, if I had to, will wear awesome boots rather than heels, but nail polish is the easiest way to make me feel like a billion bucks. My Guy Fawkes mask. I don’t like getting my photos taken, and the mask is helpful in keeping me incognito. 99 Red Balloons, each with a white LED in it & release them all at midnight. My headphone, in case the party got lame and some clothes for the sudden mood changes. Sparkly flats for dancing, darling. good friends and good food. that’s all i need. Holiday party essential - the aspirins and water consumed before bed in an attempt to stave off the headache of the next morning. A bottle of prosecco and St. Germain — makes for a delicious party favorite! all my boys and girls and that’s all we need. my santa hat. ho ho ho! My holiday party essentials are bright red lipstick and hugs! Yeah! Everybody likes a nice holiday hug! a necklace that makes my regular clothes look very festive! my holiday party essential is my talkative personality! Definitely some solid hilarious competition, Cranium or Pictionary! My toggle coat and Jack and we’re good to go! My camera and a whiskey are never far away from me during the holidays! A nice bag bring a bottle of wine and a bow-tie! Holiday essential eggnog with booze. Positive energy & joy - the essence of the Holiday season. Scrooge is never on the guestlist! The Verve Remixed Christmas album. A bottle of homemade kahlua, misletoe, ipod touch and portable dock. Basically I bring the holiday spirit where ever I go. My party essential is a plate of mouthwatering cheese and tart apples. Add some deep dark chocolate to lure people into great conversation! A bottle of good alcohol and a Christmas sweater found at the local thrift shop. My new bluetooth pocket printer is my new fun party trick. It prints little sticky photos from cellphone pictures, and it entertains young children, elderly relatives, and everyone in between pretty equally! great friends to party with! The Charlie Brown Christmas album on vinyl! Pie. Pie pie pie pie pie. Headphones, alcohol and a good excuse to leave early (so I can go watch “White Christmas” at home!). Easy, my thrift store Christmas sweater vest….BOOM! my favorite dark-as-night black cashmere scarf as the perfect complement to a fun dress, and for coziness during the inevitable excursions to the roof! I bring Bison Vodka & Apple Juice…Gets the people GOIN’! My go-to holiday essential are heels with spikes on them, so I can lightly tap them against those who are stumbling all over the place wildly! My holiday party essential would have to be the wii Just Dance game!! I’d bring my Grandma - she’s a hoot. She’d rock the Jack Spade Tote like none other. Glühwein, cantuchini, my family and friends! A bag of salted cashew brittle for the host. I bring a good mood. I’m starting to like bringing my 3-year old to parties. Obviously, I can’t take her to the kind of party where everyone is getting fall-down drunk, but for the family friendly affair, she’s way more interesting than I am! Apples to Apples (the game) and a cider (the alcoholic kind), can’t have one without the other. My holiday party essential is a safe way to get home afterwards! My Canon dSLR camera to capture the good memories! Go to the thrift store and buy a colorful tie for a couple bucks. Usually you can find something a little bold, perfect for a party. Enough money to pay for a cab home in case I drink too much. My go to holiday party essential has to be my friends, without them things are never as much fun. A bottle of vodka, to help me survive. My holiday party essential? Good friends, and a camera! My holiday essential has to be myself. It’s not Christmas unless all your loved ones are there! The “go to holiday party essential” is my Holiday Spirit which is the shine of my light and the warmth of the party. Alcoholic gummy bears— I’m definitely making them for the next holiday party I attend. my holiday party essential would be good cheer and a reindeer! For the past few years I have always been the one to hold the Christmas Party, so in my case it would be my house, pretty essential at this time of year. A big scarf (pagmina sp?) because it’s dressy and warm in those over-air-conditioned rooms. My holiday essential is a better phone!! My holiday party essential is definitely mistletoe. Definitely gets people in the mood to enjoy the party and get others involved. home drinking my fathers wine! My holiday essential is chinese food and a movie… merry christmas! Holiday party essential, a big appetite yoooooooo. Our holiday essential is Scotch ‘Gift Tape’ - it does everything from wrapping presents to hanging baubles! A bottle of Holiday Spice wine, friends, and a cute new outfit with matching bag. My holiday party essentials are sunglasses and smoke grenades so you can escape unnoticed when the things inevitably go south. my holiday essential is a great bottle of wine. A bottle of Rittenhouse Rye. My party essential is a copy of “White Christmas” and a blanket to snuggle under.Bing Crosby puts everyone in the holiday mood. My goto is my my Persol folding sunglasses. Keeps the glare off of all that snow. at least two thematically appropriate playlists - one with upbeat, dancey tracks and one with mellow tracks perfect for being background noise to conversation as the party winds down. A healthy liver, for sure. My essential? A shocking story from the past year! A good laugh is the best icebreaker when meeting new people. My go-to party essential is extra socks. Inevitably, someone spills a drink on your stocking feet, which can really put a damper on the evening. The more colourful your socks, the better! Can’t have a holiday party without Grey Goose. Party essential = fashion blogger arm party = all the bracelets I own, on one wrist. my party essential are my fantastic dance moves and camera! My holiday party essential would be cookies and games but I have to be wearing my old pocket watch as a necklace to the party. My holiday party essential musts (besides the obvious like my camera) are holiday music and candles! My holiday party essential is a bottle of Baileys accompanied by chocolate swizzle sticks! Almonds - they have protein, work at all times, and don’t get one’s hands greasy. Case of Great Lakes Christmas Ale, yum yum! My holiday party essential is a nice handmade gift. I love to give away ceramic goodies to my friends and family. A holiday essential is an iPhone to pretend to get a call to go somewhere else! A bottle JD and a pack of Lucky Strikes. A deck of cards to play drinking games with. Everyone loves a reason to blow through booze at a holiday party. Glow bracelets! They are such a fun item to pull out of my purse, share, and is a great conversation starter. I always have a stash of them at home. Plus they are fun to twist around the bottom of your wine glasses for markers. Cheers! Mulled wine FTW! God I love this time of year. Some wonderful christmas cookies and candies to eat! iPod - It’s not a party without good music! My iPhone, fully charged, with Instagram ready to capture the mistletoe moments. MY holiday party essential is a bottle of freezing cold Jaegermeister! Bacon quiche with lots of onions, fresh from the oven whenever possible. Why my Red Plaid Jacket and matching Bow Tie…of course!! I host a couple holiday get-togethers each year and my essential piece of kit is actually an old white, swivel-neck G4 iMac. Remember those? I load up a USB stick with old X-mas specials and movies and drag them onto the iMac. It takes days to do it (no USB 2 on this old-timer) but once they’re on there we’ll make a little video playlist and it transforms this relic into one of the best decorations in the house. Holiday Cookies!! As long as they are baked with love, they make everyone happy! Snow tires for my holidays on the road! A Camera. Hands down the must have for any party. forgetfulness for all the everyday’s angers, stresses and troubles. if I can leave all of that behind the door when I go in to the party, it might be the perfect evening. My German stainless steel flask! Can’t go to a holiday party with our your ‘arm candy’ to show off. 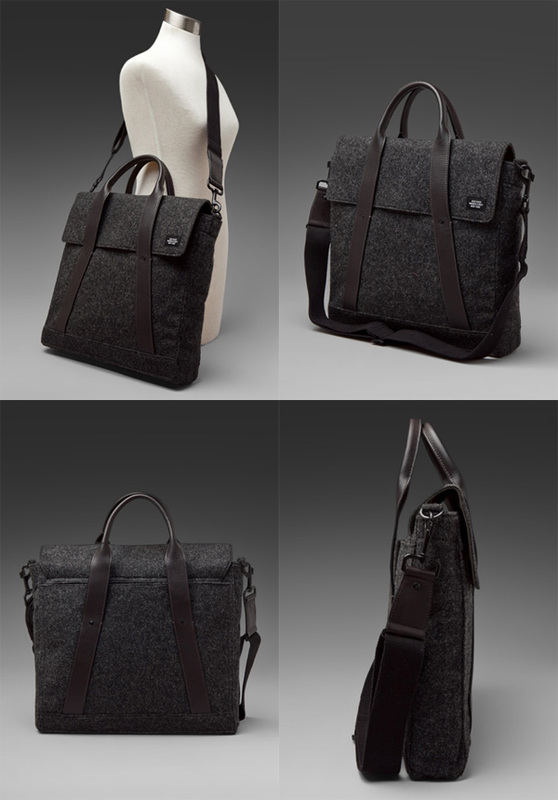 Please note, I would swap mine for this Jack Spade bag - equally stunning and impressive and less of a lush. A nice bottle of Malbec. Makes a good last minute gift or good for drinks with friends. Egg Nog, Rum, and good music. that’ll be high heels. and flats in my purse for after the pics. Holiday party essentials: A good playlist with plenty of family and friends. the mini bear boyfriend :D for whom the cub spirithood is a must! Holiday party essential? Glitter shoes! Fujifilm instant camera with plenty of film.. snap, keep and remember the fun! Water and emergen-c on my bedside table to make the next morning less torturous. A tartan shawl collared tuxedo jacket and a winning smile. No holiday party is complete without a bottle of Makers 46. Unbelievably delicious! A iPod filled with Christmas music! christmas lights for my minivan! i’d bring a little bit of merry-juana. keeps my jolly. A bottle of Kracken rum. packable flats! my feet will kill from all the dancing and walking home shoeless is no bueno. Gotta have a camera and a good bottle of wine on hands at all times! My FACE! Haha. And a freaking delicious batch of spinach and artichoke dip that happens to be the best appetizer ever. Holiday party essentials for me: caramel upside-down cake with prunes, which is absolute hit for all my friends since i’ve found the recipe, good wine and my camera. A cute coat!!! There’s nothing worse than getting all dolled up for a party and then realizing on your way out you should probably put that coat on even though it makes you look like a mint marshmallow. My Holiday essential is A huge carton of eggnog and spiced rum. Sante X1000! My go-to holiday party essential is a case of home brewed beer! This season it’s a delicious Chocolate Honey Porter! Adding pomegranate seeds to guacamole will turn any holiday party into a holiday par-tay. It will also increase your chances of choking on a pomegranate seed. All I really need is great company. But a good wine makes it sparklier! A nice bottle of wine & a homemade dish or dessert for the hosts! I come with a fresh shave and cut—gotta look fresh! Oh and chocolate, a big bag of it. My Groucho glasses! Whatever shenanigans I get myself into, at least the photos can’t prove it was me! Just be myself and enjoy the fun! My go-to holiday party essential is a bottle of interesting wine. You can never arrive empty-handed, and there’s a bottle for every occasion. Every year me and my family cut down a Christmas tree and once it’s lit and decorated the glow it gives off with a nice glass of wine or bourbon and card games. My holiday party essentials are wine, women and song … and maybe waterproof shoes for getting home in the snow! Camera (to make fun videos afterwards) and great mood! Ho and if there is just one essential to pick … music of course! My holiday party essential: good excuse to not kiss your aunt under the mistletoe. The essential things during the holidays aren’t things. But if i’d have to pick I’d go with the good gear to keep me warm during the in-between-diner walks through the snow and cold! Rudolph the Red-Nosed reindeer and a bottle of scotch! candy canes, hot chocolate, and baileys. I never leave home without a cane in my mouth and one in my pocket, and i never am home without a hot chocolate and baileys within my reach. Bottle of wine and a board game! My favourite accompaniment is Lipstick Queen’s Red Sinner. A perfect red that really brings on the Holiday spirit. My holiday party essential (well, pretty much all-party essential, but anyway) is a good scotch. That warm, fuzzy feeling is very important during this season, even when it is chemically induced. A nice warm cup of hot chocolate in hand seated by the fireplace. A bit of lip gloss and a big big smile! my holiday party essentials is a glass of holiday spiced wine, two bottles to spare, and friends to enjoy it with in front of a warm fire. Lots and lots of holiday cheer. My closest circle of friends, of course! Music, friends, & a camera! Booze booze booze and the perfect LBD. Stickon bows for instantly transforming friends to festive friends. The most awfully awesome holiday sweater! Holiday parties can only be accomplished by having multiple essentials: food, alcohol, killer shoes and a great outfit. Party holiday essentials: an open heart with the courage to try everything and have fun! Every party I attend must be accompanied with an assortment of shiny objects found on the way to the party. This bag would be great for a place to put the shiny objects. With friends: good champagne. With colleagues/family: a heaping portion of restraint. Some kind of holiday dessert (apple pie, cookies) and my camera to capture everything! “The” holiday essential fruit cake, southern comfort eggnog, and Grandma got run over by a reindeer playing in the background…ahhh good times! A cute outfit and presents! A sixpack of artisanal ginger beer for me and the other non-alcohol-drinkers (and whoever can make a charming case for me to give them one for a Dark&Stormy), and my leather leg-holster for phone & credit card & keys. The holiday essential has to be fill a lot of free stuff!!! My holiday party essential is a bottle of Tanqueray (can’t risk them not having my brand), preferably carried inside a beautiful bag that totally makes my outfit. My D7000. Always have to have to my camera on me! Wedges to be comfortable the whole day and a camera to capture the moments. MY essential is alcohol . i mean wine. Shopping list, wallet, passport, kindle fire, beats headphones, moleskin notepad, iphone, and japanese pens, and maybe vinyl toy. My ear filters. Never go to a party without them. I know safety’s boring but I appreciate my hearing. My ear filters. I don’t really go to a party without them. I know, safety’s boring but I appreciate my hearing! my holiday party essential is a purse that can hold all my stuff, but not be bulky! A good cold weather brew for sure! My holiday party essential is my chain mail necklace. Fondue, Gin & Tonics, a gift for the host, and the next day off. Time. You never seem to have enough of it, but it’s the best thing to give to the ones you love during the holidays. My holiday party essential is the deep-rooted understanding that I must ask not what this party can do for me, but what I can do for this party. Holiday party essential? Host(ess) gift for sure. holiday party essential— ugly christmas sweater! A good dessert to share, a nice bottle of red wine, and a glittery top! My holiday party essential is a fireplace. Some say its outdated or it’s a waste of wood but the truth is without that cheery, cracking fire to warm the house up the holiday season just isn’t the same. Simple… Hot Hard (spiked) Apple Cider! My holiday party essential is a bottle of champagne! My Holiday Essential is my calm presence. At this time of year especially, it is so easy to get caught up in the stress and material chaos of the season. Being calm and present helps not only with my sanity, but others’ sanity as well. Muppet Christmas Carol or corresponding Buffy Christmas episode! Including as an holiday essential, my Iphone 4 is always essential in any occasion :) And it would feel even lovier in such a cool bag! A warm bed ( with new sheets), my kitties and a good book - holiday done! Bow tie. Best way to stay classy and unique at any Christmas party. mascara,lipstick for touch-ups and my camera! Q: your go to holiday party essential? food wise - my go to holiday party essential would be my grandfather’s rich hot chocolate recipe. He only makes it in the holidays and it always makes me feel that it really truly is Christmas when I drink that cup of deliciousness. Then of course, what I think is essential for a holiday party is have a lot of to-go boxes for my big family, so they can take leftovers for home. and of course, it’s not a party without games. so holiday themed games is a must! PLUS my camera so I can take pictures of EVERYTHING! Patience, love, and good cheer. Santa Hats, duh. It’s not a holiday party without them! My holiday party essential has to be my D90!!! My holiday party essential is a mistletoe! Gotta keep things exciting. Apple cider and maker’s mark. Sparkling wine and sparkling wit. A great pair of tights- I can wear the clothes I want without freezing! I think cheerful music is the perfect holiday party essential! My holiday essential is a smile and lots of hugs to give out to all my friends. A bottle of nice, but not cheap, red wine. Good food cooked by someone else. Holiday essentials: my guitar and family. My iPod full of music playlists! friends - you can’t have a party alone! MY essential is always a bottle of whiskey! Some good drinks and dessert would be all I need! Disposable Camera(s) to be left at the Host’s after it’s all used up. An excuse to leave early… just in case. Holiday party essentials: Canton ginger liqueur and good stories! Bourbon, silly holidaze socks, a smile, and bright red cheeks! Family and friends of course, but a holiday party essential…. a strong eggnog, irish coffee, or hot tottie with Amaretto, Southern Comfort, brandy, or alcohol of your choice! Definitely a spare pair of stockings and some bandaides! My holiday party essentials: Bottle of Baileys or a box of Richard chocolates for the host/hostess. Bag big enough to store an extra pair of socks or flats for when my feet be aching! My holiday essential: My boyfriend (Nick) and a fuzzy blanket. My party essential is a bottle of wine and an exit plan in case of boredom. warm snow boots for the walk home! A carton of eggnog, a good book, and a warm bed with lots of blankets! Eggnog, a good book, and a comfy bed with lots of blankets! My holiday essential is a safe word. I get dragged along to all sorts of trite parties by my partner. We always settle on a safe word before we leave, so we can scram if one of us is feeling uncomfortable/awkward/bored/annoyed/hungry/drunk/tired/horny. My holiday essential are home made pecan pralines. Simple and yummy. A designated friend to grab cell phone in case of imminent drunk texting. An address book to note phone numbers of all the interesting people I meet! That’s easy! An extra pair of underwear in your purse. Because YOU NEVER KNOW. Hahaha. Actually, that’s gross, sorry. A pair of comfortable shoes to change into when your heels start hurting! Not to be unoriginal, but yes, alcohol. Copious amounts of alcohol. My go to holiday party essential is definitely a designated driver! A Camera and a Bowtie. Because, bowties are cool. A bottle of sparkling red wine and 12-hour sleep after. Rum cider and my camera. This bag is incredible! Holiday party essentials is some sort of food offering. Cheese/crackers, homemade cookies or muffins, etc. At least I know I have SOMETHING to eat. Just in case. A bottle of wine and good conversation. My holiday part essential is my favorite v-neck sweater, it goes with pretty much everything. And I’m thinking this bag would look perfect with it. camera! for all the great moments! What’s essential for any holiday party? Good company! A few hanks of different coloured paracord so I can sit and put sinnets on the zipper pulls of peoples bags for them while we chat. My significant other that’s for sure! favorite holiday party essential: eggnog! An empty tummy to put all the yummy party food in! An big empty tummy to put all the party food in! Hoodie. A gangsta-street hoodie. Warm and cozy. Gaffa tape. Fixes anything, and might as well save some x-mas emergencies! My holiday party essential is a hot cup of Bailey’s hot cocoa! Proper attitude will do the magic. my part essential is shiny / blingy rings! always an eye catcher! Holiday party essential…a cheerful attitude, nothing beats that! Dress Shirt and Jeans. Simplicity. Everything else falls away as long as you’re in the company of family and friends. They’re my holiday party essential. With all the snow and Christmas parties, you can’t leave the house without your Swims slip-ons! Bacon, somehow gatherings with my friends just aren’t the same unless we have bacon. A couple of Mini Grey Goose in my pocket. During holiday party hopping you have to remember the four C’s. - Cars keys left at home. Big dinners with my family! Mulled wine & anything that sparkles! A well-swept Persian carpet, because by the time we’ve sabred 32 bottles of champagne, eaten all the stuffed mushrooms and cold pea soup and cheese straws, danced all the bobby-purify-nameless-bluegrass-daft-punk dances, I’m going to be walking on someone or another’s back. Party essential for the Australian summer holiday season is a swim suit (‘swimmers”) - nothing clears the head like a dip in the pool or a plunge in the surf after a hard days night. Look great while feeling like crap. Holiday party essential: my camera, Hendrick’s gin, a christmas playlist, and obviously my friends! You can’t go wrong with a bourbon and honey infused hot toddy and cinnamon stick to stir. My holiday essential is some super glue because something ALWAYS breaks. My holiday party essential is stromboli. My family loves it. My holiday party essential is my damn camera 0_0 ! 60’s holiday classics, eggnog, and the yule log on loop on my iMac. Friends happen to be invaluable at parties! I like to bring my pet mountain lion… and eggnog. Definitely a great pair of comfortable, stylish shoes. I always feel like I spent twice as much time on my feet during the holidays—at parties, shopping for gifts, whatever. I’ve got to be comfortable, but I love holiday parties for the fabulous clothes—so a great pair of shoes that can get me and my feet through the season are essential. Right now I’m counting on a fantastic pair of ankle boots that go with everything from jeans and a sweater to a fitted suit. I’m Swedish so no holiday party is complete without Glögg (mulled wine). Glögg is seriously Christmas reincarnated as an alcoholic drink!!!!! God Jul and hopefully skål! My holiday party absolutely needs games, in specific a great party game; like Say Anything. Thermal longpants - for sure! It’s cold in London. Mulled wine or hard cider! A lovely gift for the host. Elvis Presley’s Christmas album, there can’t be a holiday party without the King. I think my holiday essential is my family, and a good attitude. ME! I’m kinda awesome. A nice bottle of red for the host/ess is also a good accompaniment. Absolute vodka….it makes anything cheerier and comes in tons of flavors + my SLR camera = Drunken party fun and pictures they’ll either love or regret the next day. A good bottle of bubbly. My film camera is an essential for everything. My party essential is homemade soda! It’s fun to make and people are sort of fascinated by it. (And I would LOVE to carry it in this bag! Something I made. I love going out looking great and knowing I actually contributed to the look, instead of just buying it all. home made waffles would be the beauties to bring. The John Denver Muppet Christmas album on vinyl. Perfect! Plastic cups. FLIP CUP! FLIP CUP! BEER PONG! BEER PONG! a baby. every part needs a baby. Yule log. And a good exit strategy. Simple but strong: A kiss. my holiday essential is a great bottle of wine. right now i’m drinking rhone varietals from a variety of locations; spain, france, california, arizona. Has to be The Squirrel Nut Zipper’s Christmas Album. Nothing says Christmas like Olde Tyme Grandpa on a scratchy gramophone. Flask of Bulleit and a good haircut. My holiday essential is the Jack Spade Waxed Wool Flag Tote. That tote looks magnificent. A Christmas sweater, preferably with as many cats as possible. My go to holiday essential is a nice haircut. Nothing makes me feel fresher and ready to meet and greet than a clean shave and fresh trim. Shoes that are fun to look at, in case things get embarrassing and I have to look down for quite some time. The Ventures Christmas album and a well made cocktail. Mulled cider and gingerbread cookies. Apart from good food, bottomless drinks and great music surrounded by people who can exchange with my ideas agreeably, an extra t-shirt and prescribed medication would come in handy. Hot cocoa with peppermint schnapps— perfect winter drink! Got to agree with cookies! The Get Easy! Christmas collection (Soul and jazz greats play original selections and renditions of xmas classics). Because Jesus was black. Lots of strong, warm punch! Moustache wax. How else will people know you’re ready for action? My go-to holiday essential is a camera. A camera and a martini. Wanting to get to know people. Listening. Everything else is just an accessory. A multipurpose corkscrew. Gotta help out with the stubborn wine corks, beer caps, and impossibly stuck labels. Good cheer! Happy holidays everyone! A thick Christmas-y sweater (it’s cold here in Ottawa! ), and/or a nice festive porter or ale! It’s not a holiday party without mistletoe…Unless it’s a family party, in which case, leave it at home! Wow, that’s a gorgeous bag. Perfect for a graphic designer like myself. I bring along a game or backup fun activity just in case the party starts to die down a bit but the night is still young. My holiday party essential is a flask to keep me warm. Some tums for all the liquor, food, and fun! First and foremost, good company of my boyfriend and/or friends, combined with my tiny old Olympus XA2 camera (w/o flash) for candid shots. Dressed well, but suitable for the purpose (overdressed is sometimes a bad choice). Citrine [my birthstone] teardrop necklace that my mother gave me—always reminds me of my family. Tartan wool bowtie, yo. It’s the reason for the season. Comfortable party shoes. I have one particular pair of great heels that I can wear for hours and hours, drunk or sober. They’re beautiful, never fail to get compliments, and most importantly, I’ve always still got them on at the end of the party, ages after all the other heel-wearers have kicked theirs off. I like to end the night looking as good as I did at the beginning. good food and company - tis the season to feast with friends and family! Emergency alcohol. Necessary to get through work and family parties. Good friends! Without them, nothing else in the world will make a good party! When requested: my cheesecake. Because everyone needs some delicious dessert. Parking myself under the mistletoe! My holiday essential? Family and friends! Eggnog. It’s not the holidays without it. My holiday party essential is with my dog and my favourite film. My holiday party essential: an extremely happy holiday mood accompanied with a big happy smile. My homemade white chocolate and raspberry mousse torte. camera is a must, to cupture all the fun! My holiday party essential are sparkly shoes. Can’t go wrong with a little sparkle! My holiday party essential has to be tasteful single malt stcotch! A glass of mulled wine. The ultimate holiday essential: your loved ones… sitting around a table with good food and a few bottles of wine! My iPhone for live-tweeting of said party. What else but a Santa hat? The perfect (yet least recognized) party essential ever. Deffinately my camera. No greater opportunity for honest candid photos than a party. a sparkly holiday dress, of course! My party essential is lots of cheap toys (pop guns, paddle ball, foam swords, etc) - I wrap them up and give ‘em out. Doesn’t matter who gets what -they work great as ice breakers when a party starts to hit a low point! A bad cold and a warm blanket, so I can stay in bed and watch non-holiday movies. My holiday party essential is a nice yummy cocktail or two to help me deal with my crazy family & friends ! “A towel, it says, is about the most massively useful thing an interstellar hitchhiker can have. Partly it has great practical value - you can wrap it around you for warmth as you bound across the cold moons of Jaglan Beta; you can lie on it on the brilliant marble-sanded beaches of Santraginus V, inhaling the heady sea vapours; you can sleep under it beneath the stars which shine so redly on the desert world of Kakrafoon; use it to sail a mini raft down the slow heavy river Moth; wet it for use in hand-to- hand-combat; wrap it round your head to ward off noxious fumes or to avoid the gaze of the Ravenous Bugblatter Beast of Traal (a mindboggingly stupid animal, it assumes that if you can’t see it, it can’t see you - daft as a bush, but very ravenous); you can wave your towel in emergencies as a distress signal, and of course dry yourself off with it if it still seems to be clean enough. My holiday party essential: Hostess/Host gift. Nothing more essential than a good time! My go to holiday party essential is the music of the lovely Billie Holiday. Perfect for any mood. It’s not a party unless I’m sporting my 100% genuine circa 1984 faux polyester “Santa(r) et all” Christmas tie! some nice music on the ipod ! sugar, in some form, preferably mixed with butter. Booze, lot’s and lot’s of booze. My holiday party essential is a bowl of mulled wine or wassail. Whether I’m hosting or bringing, it’s a lovely addition. i would take my camera and film. My holiday party essential is an empty stomach.. can’t wait for a few amazing home cooked meals! Mywife is my party essential! My holiday party essential is Rum …it goes great with Egg Nog! My holiday party essential is definitely layers of clothing. It’s the only time of year in the south when you can really bask in layering! my holiday party essential is getting tipsy before going to the party and so that i can look like i enjoy being there. Easy~ Fuji Instax camera. Everyone wants to pose for a picture. My holiday party essential? Roll of duct tape: savior of many a wardrobe malfunction and dull moments. Oh yeah that would be nice for all my camera gear. Leica worthy. My holiday party essential is a bag full of creativity to inspire my self and succeed in the next very difficult year! My essential is music. I’m always the person who does the music at parties. My holiday party essential is my chapstick. Good cheese, though it is kind of a general life essential for me. My holiday party essential , is ME MISELF AND I. My holiday party essential is my Canon 50D. I take pictures of just about everything! Definitely my camera! I’m a shutterbug around the holidays! My holiday party essential is a nice corner to hide in. A super duper ‘shut-up and dance’ playlist ready to go, accompanied by a bottle of good bourbon such as Bulleit or Bookers with an amazing old fashioned recipe that has a secret ingredient. I like to turn up early and bring some headphones for if the music is awful. my holiday party essential HAS to be my camera!